Modern RE systems are dependable, safe, powerful and user friendly. In a typical system, electric power in the form of DC electricity is produced by an RE source, i.e., an array of solar panels, a wind generator or hydro generator. This power is stored in deep cycle batteries, and is available as needed. Charge controllers prevent damage to the batteries from overcharging, and many have built-in meters to monitor battery charge status, incoming and outgoing power, etc. Inverters turn the DC power from the batteries into the AC power commonly used in the home. Super energy efficient appliances keep the overall size of the RE system to a minimum. All these components are described in more detail below, and come in a large variety of sizes and capabilities. The components can be combined in an infinite number of ways to create customized systems to support your electrical need, or load. Kits provide pre-fabricated systems designed to do a specific job. Photovoltaic modules (PVs), or solar panels, are electrical semiconductors, like transistors. They are made of layers of silicon. The N layer has an excess of electrons, the P layer has a deficit. When the layers are struck by photons from light, extra electrons from the N layer are knocked loose and travel to the P layer. A circuit connecting the two allows you to divert the flow of electrons, the electric current, to do useful work, like charging a battery or powering a motor. the PV into the battery, like water flowing down hill. Batteries can be connected in series for multiples of 12 volts (24,36,48 etc) and so can PVs. However, PVs don’t have to be used with battery systems. The simplest systems of all are called "array direct". For example, a small solar panel on the roof can be directly connected to a DC fan for a very efficient attic vent system. When the sun shines, the fan spins. Battery systems provide a means of storing the harvested energy for later use. PVs put out the most power when its clear and cold. When it’s really hot, they may put out slightly more current but the voltage is lower. Some of the newer modules like the United Solar triple junctions are very heat tolerant. PVs produce power in cloudy and overcast weather, just not as much as in bright sunshine. Why do solar panels cost so much ? Simply put, they don’t. Considering that you never have to put gas in them and they just keep making power for years (most have a 10 to 20 or more year warranty) they are an unusually good buy. It’s just that the cost is all up front. Can I run my whole house on solar power? Sure you can. Thousands of people all over the world are doing it. If you use air conditioning it will cost about as much as a new car. The first step is to make the home as energy efficient as possible, then the renewable energy system will be smaller and cheaper. Many mass produced appliances simply aren’t designed to be energy efficient, and will need to be replaced. For example, a typical refrigerator will require power from 18 to 22 fifty watt PVs, whereas a super efficient refrigerator can be powered by only 3 of the same modules. Yes, there is that big a difference. A small starter system is a good idea and provides for training and familiarity with how a renewable energy system functions. A simple home backup power system that can provide power for TV, computer, fans, lights and small appliances can be had for about $1500. This system would include 1 or 2 batteries for storage, a charge controller, 1 or solar panels, mounting hardware, electrical fuses, circuit breakers and disconnects, and an inverter in the 700 to 1500 watt class to provide AC power. Wind Generators come in a variety of sizes. The smaller ones are easily installed by the do-it-yourselfer. The medium sized wind gennys (generators/gensets) are probably best used on modern tilt-up towers that provide for safe lowering and raising. The largest gennys will probably require the use a crane to place them on large, fixed towers. Small and medium gennys usually produce power that is stored in an RE system battery bank. Large gennys usually are grid intertied, i.e., they pump power straight into the local utility grid. If you think you have a good wind site, you probably do. You can use a wind speed measuring device to evaluate your site. Most wind gennys are rated for power @ speed, for example, 1000 watts at 25 miles per hour. This means that at 12 mph wind speed the genny will produce quite a bit less than the full rated 1000 watts. The various manufacturers usually provide a chart or `power curve' showing power output at various wind speeds. Some models produce more useable power in the 10-15 mph range than others, so it pays to compare curves. The other factor you need to know about in considering wind machines is turbulence. Straight, laminar flowing air is capable of imparting more of its energy to the genny than is rolling, turbulent air. Trees and other obstacles can produce a cone shaped region of turbulent air that can extend downwind 500 feet or more. A good rule of thumb is to pick a tower that will place the bird at least 20 feet higher than trees or obstacles within 500 feet. At our site the wind is almost always from either the north or the south, so those are the only directions we need to worry about. And old saying has it "The higher the tower, the more the power." Wind machines can work together with solar panels to store power in your battery bank. Sometimes when the sun isn't shining, the wind is blowing, and vice-versa. 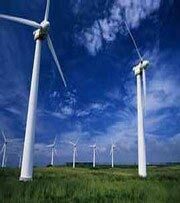 Wind generators are graceful, beautiful birds that are a joy to look at as well as providing power. Hydro Generators can be divided into basically two types, low head and high head. 1 gallon of water falling 100 feet (high head) contains as much energy as 100 gallons falling 1 foot (low head). In a typical high head system a pipe contains water from a source high above, a stream or lake. The pipe may be thousands of feet long, and be a drop or head of several hundred feet. The water at the bottom end of the pipe is under pressure from the weight of all the water above it. When released through a nozzle, a jet of water sprays out and hits a special wheel with cups, called a pelton wheel, causing it to spin. The spinning wheel turns a generator which produces power. These systems are usually custom designed, with the shape and number of nozzles matched to the pressure and flow volume of the water. In a typical low head system propellers or turbine blades are turned by the water in a stream or lake overflow. A venturi shaped structure can be built to funnel the water passed the generator at a faster rate. This type of hydro generator can also be attached to sailboats. Batteries used in RE systems are deep cycle batteries, much different from vehicle starting batteries. Starting batteries are made of many thin lead plates, and are rated in `cold cranking amps', just what you need to start your car. Deep cycle batteries are made of fewer and thicker lead plates, and are rated in `amp hours capacity'. Deep cycle batteries are made to withstand repeated charge and deep discharge cycles that would ruin a starting battery. A good example of a deep cycle battery is the common golf cart battery, and in fact it is the most common battery used in home RE systems, especially beginner systems, as it is readily available and cheap. Six volt golf cart batteries are connected 2 in series for 12 volt systems, 4 in series for 24 volt systems, etc. Batteries can be connected in series-parallel combination for greater storage capacity. Larger capacity batteries come in 2 volt cells, where 6 are connected in series for 12 volt systems, etc. Although NiCad, Nickel-Iron and other battery types are available, the lead-acid battery is still the most commonly used in RE systems and comes in two types: flooded batteries contain a liquid electrolyte solution, gell cells contain a gelled electrolyte. The gell cells are best for low maintenance and portable solutions, as they can be used in any position and don't require checking of the electrolyte level. Flooded cells are cheaper for the same storage capacity. Both types give off dangerous gasses when charging, more so with the flooded type, and battery enclosures should be vented to the outside. Charge controllers are available from the very simple types that do only one thing on up to the complicated types that perform several different jobs. At the most basic level, charge controls prevent damage to the battery from overcharging. When the battery is fully charged, the controller either shuts off or diverts the power being produced by the RE system. Solar panels are easy to control. The circuit is simply opened so power doesn't flow from the panel. Controllers also keep power from flowing backwards from the battery to the panel at night. Hydro and wind generators usually require their power to be diverted into a load when the battery is full, not merely shut off like a solar panel. The load can be anything from an electric water heating element to some light bulbs, as long as the load is sufficient to absorb the rated power of the generator. In grid intertied systems surplus power can be fed back into the grid. Charge controls are rated for system voltage and the amount of current in amps that they can handle. Options for charge controllers include 1) meters to monitor battery state of charge, incoming and outgoing amps, etc., and 2) load disconnects that switch off loads when the battery voltage falls below a setpoint. Inverters are electronic devices that change the DC electricity stored in batteries into the AC electricity commonly in use in the home. Inverters fall into basically two types, modified sine wave and true sine wave. Modified sine inverters produce a waveform that is composed of many square edged steps, whereas sine wave inverters produce a smooth, sine wave. Modified sine inverters are less expensive, and usually work just fine for most all appliances. However, some problems can be encountered such as: microwave oven clocks reading inaccurately, and some ceiling fans and fluourescent lamps may hum or buzz. These problems are non-existant with sine wave inverters, which produce better and cleaner power than your local utility grid. Inverters are rated by system DC voltage, output AC voltage and frequency, and power capacity in watts. Most inverters used in USA produce 115 volt 60 herz AC power. Two inverters are `stacked' for 230 VAC or a transformer can be used. Most inverters for international use produce 230 volt 50 herz AC power. Inverters range in size from tiny pocket size units to power your laptop all the way up to large wall mounted units that can power your whole house or business. Grid-intertie inverters can send surplus power back into the utility grid. Battery charging inverters can take AC power from the grid or a generator and turn it into DC and charge the battery bank. Energy Efficient Appliances often cost more than their mass produced counterparts, but can result in dramatic savings in required RE system components. The less power consumed, the less need be produced. A super efficient refrigerator might cost twice as much a conventional unit, but be 10 times or more efficient. Common incandescent light bulbs use over 90 percent of the energy they consume making heat ! Compact fluourescent lamps cost more initially, but over time are the most inexpensive. The new LED lamps are even more efficient. A balanced study in RE technology should include at least as much investment in learning about energy efficiency as that spent on learning about RE power producing hardware.